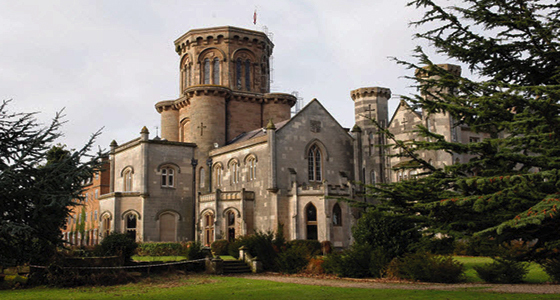 Studley Castle is not a castle as such but sits close to the site of a 16th century medieval house; it is a grand Gothic Revival country house, designed by Samuel Beazley and completed in 1836. It is currently a hotel but its former uses have included a horicultural college for ladies and offices for Leyland and Rover Cars. Tracey and Rachel visited the hotel for a medieval feast, which was good fun. The entertainment was enjoyable and the company, excellent. Having been allocated a reputedly haunted room high in the tower, we were eager to record during our stay and we were not to be disappointed with the results. It will be interesting to revisit the castle after its recent refit and see if the alterations have encouraged phenomena, as sometimes happens. EVP 1: Recordings made by the group during seances are always in red light. The request for red light is unusual unless the speaker assumed we were holding a sitting, which we were not. EVP 2:The acoustic properties of this clip do not make for easy listening, although it's message is amusing. EVP 3:This is an unusual clip because of the accent, it is very out of character for the region. We have no idea who the speaker is or who his aunt was. EVP 4:This was recorded in our tower bedroom and there were no portraits hung on the wall. It is a shame that we do not have a name to marry to the clip. EVP 5:Rachel was talking to Tracey about the infra-red beam of the camcorder that had been positioned in the corner of the room. We had asked for those who may be connected with the castle to come forward.